Which measure would not be useful to help you determine the change in angular velocity when the torque on a fishing reel is increased? This is College Physics Answers with Shaun Dychko. Here is a side view of the spool of a fishing line. It has some radius and there is a torque being applied to it. The question is, what information would be useful to figure out the change in angular velocity? So change in angular velocity is angular acceleration multiplied by time you could say, that's one approach. The angular acceleration will be the net torque which would just be the torque applied because I don't think there's any other torque in this question, divided by the moment of inertia of the spool, multiplied by time. This net torque would be the force applied multiplied by the radius of the spool, and this moment of inertia factor would probably also include the radius of the spool. 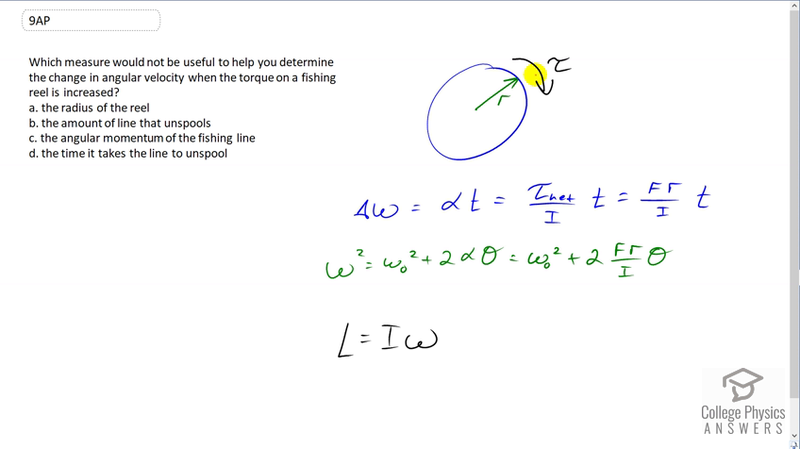 Another approach to find angular velocity would be to say that the angular velocity squared is the initial angular velocity squared plus two times angular acceleration, multiplied by the angular displacement which we could figure out based on the amount of line that has been unspooled. Again, this angular acceleration factor can be replaced by F r over i. The radius of the reel is appearing in either of these approaches and so we want A. The amount of line that unspools is related to theta if we took this approach in green, or the times it takes to unspool would be useful for this approach in blue because there's a time factor there. The angular momentum is not relevant because to calculate angular momentum you need moment of inertia multiplied by angular velocity. But if we knew what the angular velocity was, then we would just be able to take the difference between the angular velocities at two different times and that would answer our question for the change in angular velocity and there'd be no need to multiply it by something else to figure out angular momentum. So part C, option C is the answer, we do not need angular momentum.